A very attractive reclaimed hardwood front door. We believe the door is mahogany or teak and is approximately 30 years old. The door has a fantastic design imitating classic Georgian style. The door is very well made and solid, with mortise and tenon joints. Each side has raised and fielded panels with nice mouldings and the inside of the door is particularly attractive. There is a letter box space for purchaser to add door hardware to suit. 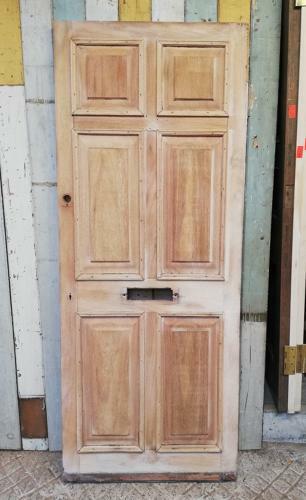 The door has been stripped to bare wood and is ready for finishing by purchaser to suit. The door has 3 hinges and will need to be hung with 3 hinges to support the weight of the door. The door is in very good, reclaimed condition, but has some slight signs of wear. The wood does have some texture and there are some marks, scratches and slight signs of use. There are some small knocks to the door edges, small holes and the drip bar has been removed leaving some marks and scratches. A new drip bar is needed. The door is almost square and in good condition for a reclaimed item. The letterbox space has some wear and marks where the original has been removed. The door is a very well made and quality item with a fantastic design, perfect for adding character to a home.